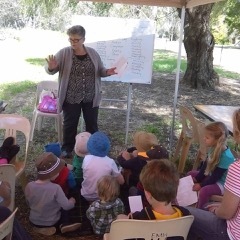 Photo of Lorraine Marwood presenting as part of a series of creative workshops on the Campaspe River in Elmore called Exploring the Campaspe. Photo by Meg Doller, Project Manager. This great photo of Lorraine in action was taken by Meg Doller during Lorraine’s workshop ‘two word poems’ with a bunch of young people. Meg is project manager of a series of creative workshops on the Campaspe River in Elmore called Exploring the Campaspe and Lorraine’s workshops were the first to be offered. Lorraine is an amazing facilitator and the children wrote a series of wonderful works. We loved having her in Elmore! Thank you for this info, Meg.